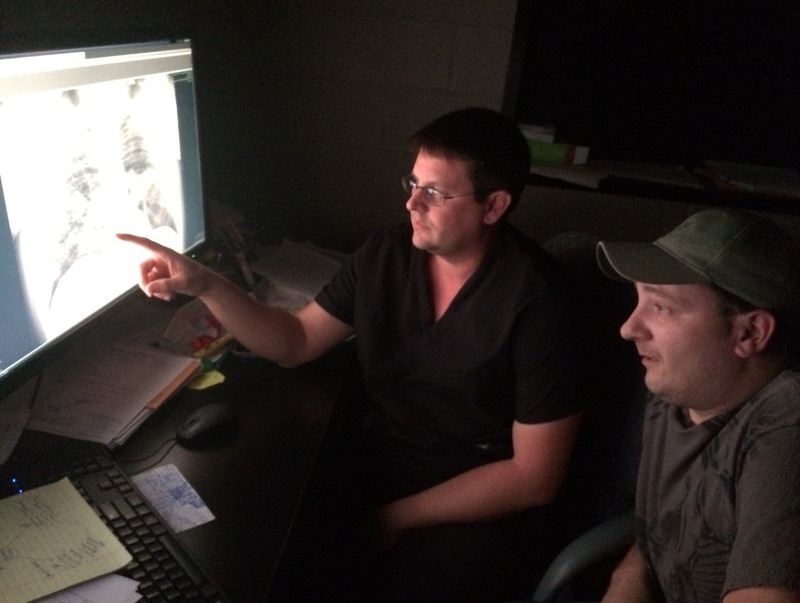 Radiologist Dr. Brandon Crum reviews an X-ray of the lungs of Mackie Branham, who suffers from advanced black lung disease. Dr. Crum is among the Kentucky radiologists now barred from assessing X-rays in state workers' compensation cases filed by coal miners seeking black lung benefits. A measure signed into law in Kentucky this past week would prevent federally-certified radiologists from judging X-rays in state black lung compensation claims, leaving diagnoses of the disease mostly to physicians who typically work for coal companies. The new law requires that only pulmonologists — doctors who specialize in the lungs and respiratory system — assess diagnostic black lung X-rays when state black lung claims are filed. Up until now, radiologists, who work in evaluating all types of X-rays and other diagnostic images, had been allowed to diagnose the disease as well. Just six pulmonologists in Kentucky have the federal certification to read black lung X-rays and four of them routinely are hired by coal companies or their insurers, according to an NPR review of federal black lung cases. The two remaining pulmonologists have generally assessed X-rays on behalf of coal miners but one is semi-retired and his federal certification expires June 1. Among the radiologists excluded by the law is Dr. Brandon Crum, who helped expose the biggest clusters ever documented of complicated black lung, the advanced stage of the fatal disease that strikes coal miners. "I do believe the coal industry is writing this bill to exclude certain doctors that they don't like," said Phillip Wheeler, an attorney in Pikeville, Ky., who represents coal miners seeking state black lung benefits. The changes are part of sweeping reforms to Kentucky workers' compensation law, known as House Bill 2. Workers' comp provides medical and wage replacement benefits for miners suffering from black lung. Dr. Crum is the most visible of the excluded radiologists. His clinic in Coal Run Village, Ky., was the focus of a 2016 study by epidemiologists from the National Institute for Occupational Safety and Health (NIOSH). They verified 60 cases of complicated black lung that had been diagnosed in a period of about 20 months in 2015 and 2016. NIOSH had previously reported 99 cases nationwide over a five-year period. At the same time, NPR and Ohio Valley ReSource reported nearly 1,000 cases across central Appalachia, prompting NIOSH epidemiologists to declare it the worst epidemic of complicated black lung they'd ever seen. Our ongoing survey of black lung clinics and law offices has the current count of advanced black lung diagnoses at more than 2,200 since 2010. "Throughout the United States, I know of nowhere where radiologists are taken completely out of the evaluation for potential black lung disease," Dr. Crum said. "That's what we're primarily trained in." Physicians who read chest X-rays for work-related diseases like black lung are known as "B readers" and are certified by NIOSH for both federal and state compensation claims. B readers do not specifically have to be pulmonologists or radiologists, though they can be both. Radiologists, on the other hand, focus entirely on reading multiple types of X-rays and other diagnostic images. The law also bars out-of-state radiologists who are both NIOSH-certified B readers and medically-licensed in Kentucky. That includes Dr. Kathleen DePonte, a radiologist in Norton, Va., who has read more than 100,000 black lung X-rays in the past 30 years. "It is curious to me that the legislators feel that the pulmonologist is more qualified to interpret a chest radiograph than a radiologist is," Dr. DePonte said. "This is primarily what radiologists do. It is radiologists who receive all the special training in reading X-rays and other imaging." Dr. Edward Petsonk, a pulmonologist at West Virginia University with decades of experience and research focused on black lung, points to a 1999 report of pass-fail statistics for physicians taking the NIOSH B reader examination. Two-thirds of the radiologists passed, while the success rate for pulmonologists was 54 percent. A comparison of a healthy lung and a lung ravaged by severe black lung disease on display at the National Institute for Occupational Safety and Health in Morgantown, W. Va.
Radiologists, pulmonologists and other physicians don't necessarily read X-rays the same way. Those who work for coal companies tend to be conservative in assessing black lung because the coal companies or their insurers pay black lung benefits. Those reading X-rays on behalf of coal miners are often accused of being too liberal in their assessments. Judges often decide which assessments count most. This seemed to frustrate Rep. Adam Koenig, a Republican from Erlanger and the primary sponsor of the changes in the law. During the House floor debate on the measure, Koenig said one B reader finds black lung 41 percent of the time while another's rate is 91 percent. "Obviously we do not have a standardized process so we are trying to standardize it," Koenig said. "No one here is trying to deny anyone who does that work from getting their black lung claims." That's precisely what the new law will do, argued Rep. Angie Hatton, a Democrat from Whitesburg. "When we're finding increased amounts of this illness it seems to me that this is when they need us the most," Hatton said. "Why are we making it tougher for them to prove their illness?" In an interview with NPR, Koenig said he "relied on the expertise of those who understand the issue — the industry, coal companies and attorneys." He'd heard "anecdotal stories," he said, about lung cancer being misdiagnosed as black lung. Early stages of lung cancer and black lung can leave similar masses on lungs, according to West Virginia University's Dr. Petsonk. But Dr. Petsonk also noted that coal miners exposed to silica dust "are at an increased risk of lung cancer. They do get lung cancer. Silica is a carcinogen." 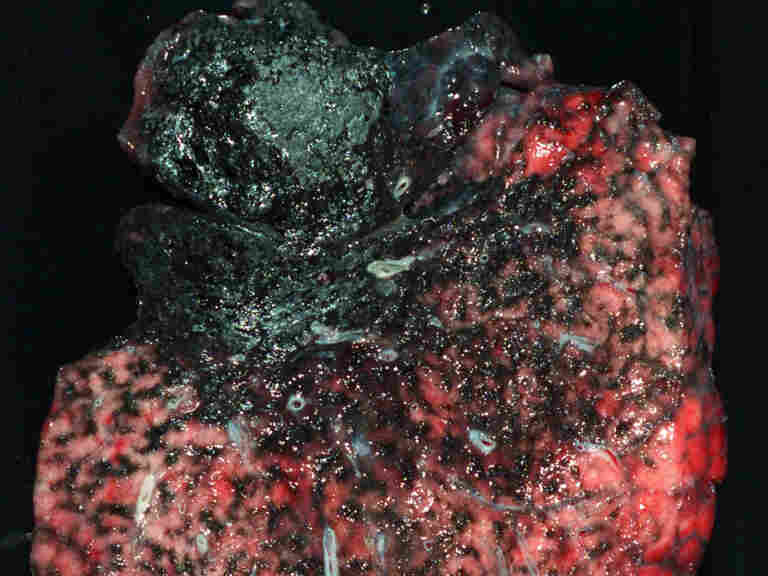 Severe black lung disease deeply scarred the lung of a 61-year-old West Virginia coal miner, which was removed as part of a lung transplant. Former coal miner William McCool believes he would have been denied state black lung benefits if the new law had been in place when he applied for compensation. "It'd be pretty much impossible," McCool said. "I've had lung doctors tell me I don't have black lung." McCool said it took two years to win his state claim because the doctors working on behalf of a coal company were conservative in assessing his disease. But the 64-year-old from Letcher County ultimately prevailed and has been diagnosed with advanced disease. 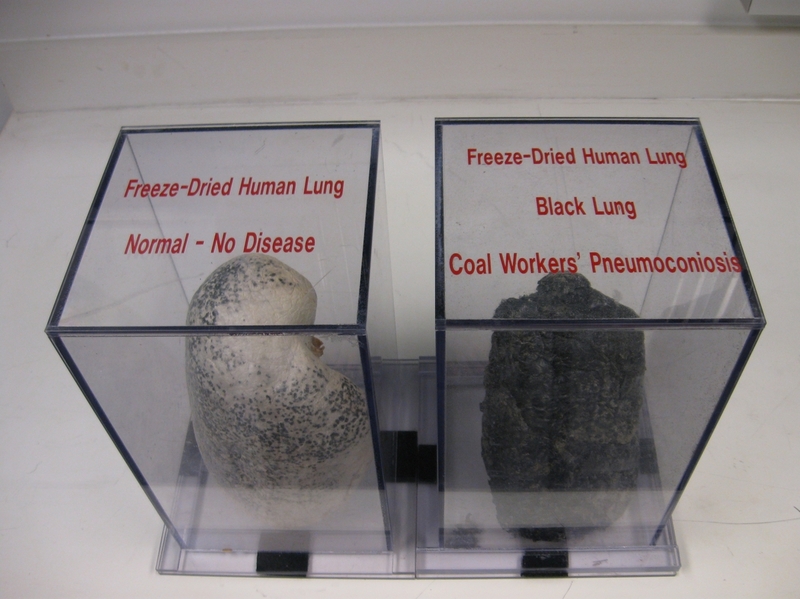 The federal black lung compensation program continues to rely on all NIOSH-certified B readers, whether they are pulmonologists, radiologists or other physicians. But seeking federal benefits instead of state workers' compensation is not necessarily an easy option. Dueling assessments in the federal system mean that some miners have waited more than a decade for decisions on federal benefits. Some die before receiving them. State benefits have traditionally been quicker and more generous to miners. That seems to be changing, said Evan Smith, an attorney at the Appalachian Citizens' Law Center in Whitesburg. Smith said the new state law "keeps Kentucky coal miners from using highly qualified and reliable experts to prove their state black lung claims [and] looks like just another step in the race to the bottom to gut worker protections." Koenig insisted that's not the case. "All we're doing is making sure that qualified doctors are making these determinations," Koenig said. "And if this process doesn't work, I'll be the first in line to figure out how to do it better."